It didn’t take long, back in horse-trailer row, for the jokes to start up about borrowed horses . . . and the legal ramifications thereof. “Wasn’t there some kind of contract?” wisecracked one gal. “Oh, there’s gonna be now!” shot back Ron Vogel. Just three days before the Calgary Stampede’s 7 Class Team Cattle Penning competition began, Vogel’s horse came up lame, and he reached out to a friend, Michelle Waldner, of De Winton, Alta., for the services of Casey, a 14-year-old quarter horse gelding. No, he didn’t. In fact, Casey’s substitute heroics carried Vogel to his first Stampede championship on Monday evening at the Pengrowth Saddledome, with teammates Denise Guzowski of Millarville, Alta., and Debbie Myslicki of Calgary joining in the 7 Class title celebrations. 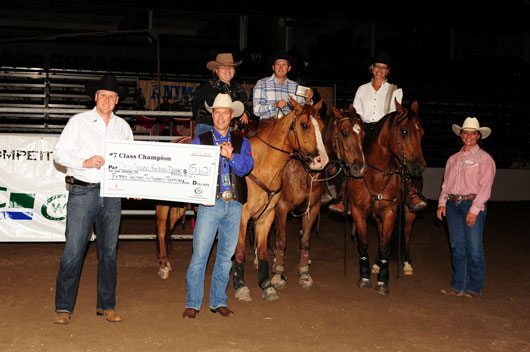 The trio’s victory was worth $15,621 from a total prize purse of $52,070 in the 7 Class, the final division contested this year at the Stampede. Their winning aggregate time over 12 head of cattle was 139.5 seconds, a sizeable margin better than the runner-up trio of Larry Cressman of De Winton, Rob Schalk of New Serepta, Alta., and Clayton Mason, who turned in a time of 159.35 and split the reserve champions’ cheque of $10,414. A race against the clock, Team Cattle Penning gives a team of three riders on horseback 60 seconds to separate three specifically identified cattle from a herd of 30 and direct them into a 16-foot-by-24-foot pen at the opposite end of the arena. Teamwork is key, with all three riders working in harmony to cut out the correct cattle and drive them to the pen. Vogel, Guzowski and Myslicki entered Monday’s third round and final at the Saddledome sitting pretty, with the lowest aggregate time of the elite 20 teams who qualified out of an original 127 during preliminaries at the Okotoks Agricultural Society. Their enviable time of 37.34 seconds in the final cemented the win. If there were a hard-luck award of the night, it surely would have gone to the team from British Columbia’s Lower Mainland of George de jonge, his daughter Cathy Sinclair, and his granddaughter Taylor Sinclair. The trio was very nearly home and dry, and looking at a great time that almost certainly would have meant victory, when one steer sneaked its way back up between the fence and the back wall. They absorbed a no-time score for the fourth round, and finished fifth overall. In all, the Stampede handed out more than $225,000 in prize money this year in four Team Cattle Penning divisions, attracting a total of 481 teams from across the Western half of North America.